Note: As I begin this blog, I’ll be toying around with different kinds of posts. For now, Friday Night Delights will be a column about drinks and cocktails to enjoy on the weekend. The name is spin on that of one of my favorite TV shows, NBC’s Friday Night Lights. The show is centered around a small, fictional town in Texas where everyone spends their Friday nights watching high school football. If you’re turning up your nose at the word ‘football’… Please. My dad is still trying to teach me what a ‘touchback’ is. So, watch it! It’s shot beautifully, and the story will reel you in straight away. Anyway, my favorite Friday nights are usually spent drinking cocktails with friends — not watching high school football — so that’s what I’ll aim to do here each week. On a cold, wintery night, a little kick will help you warm up — but a blanket or fireplace helps too. This cocktail is a good winter remedy. 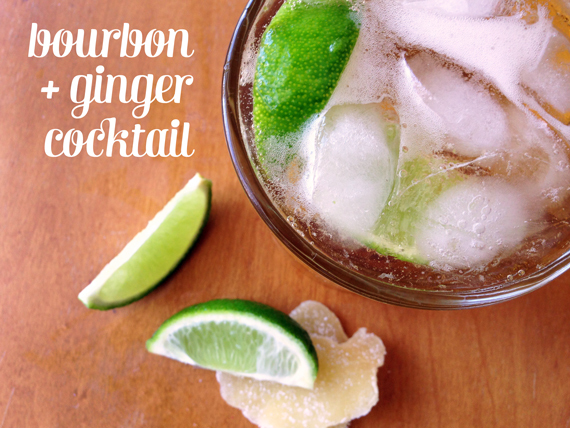 If you’re nursing a cold, the lime and the bourbon will soothe your throat. Also, the ginger has healing qualities for upset stomachs, but this cocktail is fantastic if you’re healthy too. The addition of candied ginger here gives this cocktail a little extra spiciness, plus it’s something to nibble on once the drink is gone. Pour 1 oz. bourbon into each ice-filled glass. Divide ginger ale among glasses. Squeeze one lime wedge into each glass. Garnish with candied ginger and serve immediately. This drink sounds great! I actually have a little Makers Mark left over from a get together over the holidays. I may be on my way to a toasty bourbon + ginger cocktail tonight. I’m always at a loss for what to mix, so I can’t wait to see what other drinks you share! Yes! I tried this with Maker’s Mark over the holidays and it works just as well! You can also substitute lemon or omit the citrus altogether. Let me know what you think!